I'll get to the guinea pigs in a minute but first I want to help you understand how similar you and I are. We're built the same. We both have super small structures that work together as cells to form the various tissues and organ systems that make up our bodies, keep us healthy and performing well. Every single one of our 100 trillion cells (for the average 150lb adult), contains an instruction manual that tells it what to do and make to ensure our bodies function properly. That instruction manual is a set of genes that forms your genetic code - and 99.9% of my genes are the same as your genes which are the same as your grandma's genes which are the same as Arnold Schwarzenegger's genes. But - there is that .01% difference to keep things interesting. The differences are called genetic polymorphisms and they explain why you and I may react differently to the food we eat. If we were all 100% genetically the same then a one-size fits all diet would work for everyone and it would be a simple matter of testing all foods to see if they improve or do not improve health and performance. We could keep all the good foods, get rid of the bad and the obesity problem would be over. Problem solved. But we're not the same - so a diet of certain foods that makes me feel good and perform at my peak may not be the optimal diet for you. For instance - every one has a gene in our livers that makes an enzyme that breaks down caffeine. In some people that enzyme breaks caffeine down quickly leaving the beneficial antioxidants behind and they get health and performance benefits from 1-3 cups of coffee a day. Other people's genes make an enzyme that breaks caffeine down slowly so the same 1-3 cups of coffee may have detrimental health effects. Certain foods have bioactive components that upregulate (turn on) genes - also referred to as gene expression. Brocolli has a component called isothiocyanates that will switch on a specific gene in the liver that detoxifies cancer-causing chemicals and other toxins. Cooked tomatoes contain lycopenes that turn off growth-promoting genes in the prostate. No cooked tomatoes in the diet = higher risk of prostate cancer. Fish oil (specifically DHA - fatty acid found in fish) tells genes in the brain to make a chemical that helps keep Alzheimer's away. If you take fish oil you have better cognitive (brain) function as you age compared to people who don't. Noteworthy: there is a fascinating branch of science called nutrigenomics that studies how nutrition influences gene expression. It's interesting to think that what you eat is causing things to turn on and off in your body. I know I just spent a few minutes listing the ways we are all different enough to make a one-size fits all diet unworkable - but there is one diet that works for 100% of human beings on the planet. It's the guinea pig diet. Now don't go frying up the family pet quite yet. Since at least the 1700s, guinea pigs have been the subjects of a host of experiments for the benefit of mankind. Guinea pigs played key roles in germ theory, standardization of vaccines and antivirals, and have even been launched into space on numerous occasions. Indigenous groups of South America eat guinea pigs and since 1960 there has been a push to use the animal for food consumption outside of South America - but I'm not telling you that guinea pigs are a super food you need to add to your diet. 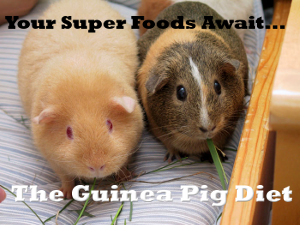 The guinea pig diet is a method for building your optimal diet using yourself as your own guinea pig. It's a framework for experimenting on yourself to see what works and what doesn't in a world of nutrition information that seems to contradict itself at every opportunity. Given your unique genetic profile - you won't know what your super foods are until you test how you react to those foods and objectively measure the outcomes. As you grow up you kind of do this intuitively anyways. You figure out at a young age that eating too much of something like super rich chocolate cake or ice cream can make you feel bad or anxious. The guinea pig diet takes it a step further to make you really pay attention to what's good for you and what isn't - and it's totally unique to you and your genetic profile. The guinea pig diet is a framework for building a list of foods unique to you that you can and should eat to achieve optimal health and performance. That framework consists of envisioning a goal, establishing a baseline and then testing foods against that baseline to discard the bad foods and keep the good ones in your diet. Said another way - the guinea pig diet is a method for determining what foods and drinks in the right amounts at the right times will enhance your performance and health. Goal: Acts as the guiding light to keep you on track when assessing what works and what doesn't. Includes the MoE (Measures of Effectiveness) that give you a clear indication of a positive or negative result from your test. Establish Baseline: You need something to test against to measure improvement. Serves as the starting point which can be where you are now or you can start with any of the popular diets and the guinea pig diet will tailor them for your unique situation. Testing: You introduce foods to your baseline diet one at a time in a controlled manner. We'll cover how to do this properly because there is both an art and science to it. 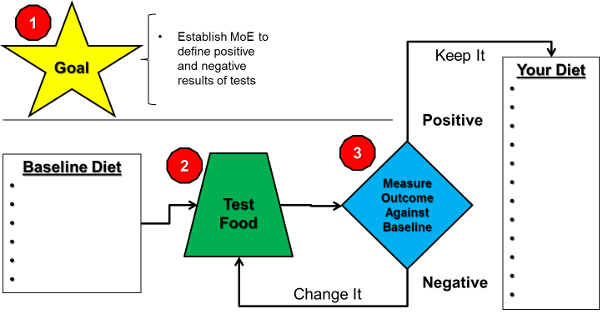 Measure the results against the baseline: The results of your test compared to your baseline will determine if the food you introduced should be kept or discarded and in what quantities. We all know that the good tasting foods tend to be the ones that are bad for us, but the good thing here is that lots of those seemingly bad foods in moderation really don't harm us at all so there can be a place for them in your diet. This process takes some time. You can't build your perfect diet overnight - but stick with it and eventually, incrementally, you'll be eating a whole lot better and seeing the results with better health and performance.